Ex-Aussie Olympian identifies flaws in India’s hockey system but says with scientific approach and immaculate talent spotting, the former world champions can regain the golden days. In an exclusive chat, Nobbs congratulated the junior girls for winning India’s first World Cup medal but cautioned against a general “burnout” due to a lack of scientific and long-term diet plan in the coaching system. “I have two teenaged daughters and they are part of an Australian system that not only takes care about their skills but their health as well. India have to adopt such an approach or else, these girls from rural India would be lost forever,” said Nobbs. “The welfare of India’s hockey has always been topmost in my mind. I am not trying to point fingers at anyone, I am just trying to say that India can do much better with proper scientific training and approach”, Nobbs said. Anaemia is a medical condition indicating iron deficiency in the body leading to tiredness and lethargy. “It’s a very common among girls and in India it is acute. How do you expect the girls to match the healthier and stronger European girls in a world competition? Considering this, the bronze (India beat England) has been a brilliant achievement. It’s nice to give cash awards, but there is a lot to do with these kids,” said Nobbs. The veteran coach said anaemia can be controlled with proper scientific diet and monitoring. “I was surprised to meet a dietician in SAI, Bangalore who has been working for the last 40 years without having done anything noteworthy,” Nobbs said, adding the government was simply wasting its resources. The 59-year-old Australian, who resigned last month on health grounds, is flying to Perth to seek medical advice for hyper-tension before travelling to Hobart to meet his 15-year-old daughter, a hockey prodigy. Nobbs’ elder daughter is an international figure skater. Nobbs left with mixed feelings on Indian hockey. While his deteriorating health condition – fluctuating blood pressure and hemorrhoids – forced him to stand down as national coach, the genial Australian was unhappy with several issues that threw a spanner in his work. “I couldn’t have carried on like this and with a few things not going the way I was wanting, I think resigning was the best option. I surely wasn’t sacked. The media reported without checking the facts but that’s expected when you are doing a high-pressure, high-profile job,” said Nobbs. 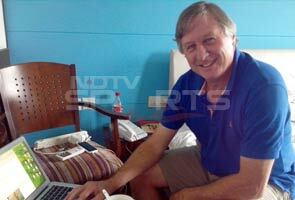 Nobbs said Hockey India’s secretary-general Narinder Batra was a man with a mission. “He surely is eager and putting in a lot of effort and money in Indian hockey. He surely is demanding and why not? But he won’t be able to do things alone. For example, if the national selectors are watching just eight games and picking talent for a national, Indian hockey is going nowhere. You are doing injustice to a great kid because his team lost in the first round,” the Australian Olympian said. Nobbs has presented a vision statement to the Sports Authority of India, a much maligned body in India. The Aussie, on the contrary, says SAI has a big role to play and can turn things around in the country. “My understanding of SAI is that it has to be the driver. If SAI is funding Indian sport, it has the right to ask questions. That’s not happening. National federations must be answerable to SAI and I can tell you there are honest men in SAI with lot of vision,” said Nobbs. The Australian said India badly needed a Sports Bill. “It will raise accountability. There are just too many people in the establishment who have taken things for granted. And the national bodies have to be wary about ex-players who act like advisors. The game is much more scientific now. You have to accept change to keep pace with the world,” said Nobbs. “India normally play well against Asian teams. We should be able to beat Malaysia, Pakistan and Korea to make the World Cup,” said Nobbs, who of course added that India are not at full strength. According to him, the absence of Shivendra Singh, Sandeep Singh (both dropped); S.V. Sunil and Danish Mujtaba (both injured) will be felt. This entry was posted in Corruption, Education, Sports and tagged Australia, Hockey India, India, Michael Nobbs, Nobb, Rani Rampal, Sports Authority of India, World Cup on August 8, 2013 by missionsharingknowledge.